As a child I spent precious hours drawing angels and fairies and making paper dolls. I always wanted to be an artist. However, to meet the challenges of life I had to abandon art as a young adult to raise my family and become involved in the hectic business world. Then in late 1992, it felt as though I were becoming too aggressive in the business world – so much that it felt as though much of my femininity had been lost -- I was too competitive and was “selling my soul for the mighty, old buck.” After much prayer and meditation a big leap in faith was taken. I quit my job and decided to live life the way I really wanted to – to paint!! 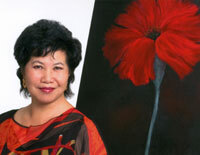 What a blessing – I now paint full time and am no longer selling my soul, but am feeding my soul when I paint! Painting is a way of passionately expressing Spirit. There is a lot of pain and darkness in the world, but I consciously choose to express the Light and beauty in life, which is what hopefully, you will see in these paintings. So please browse and feel the spirit in my paintings.